This duvet cover is so soft! It's durable too. Love it! 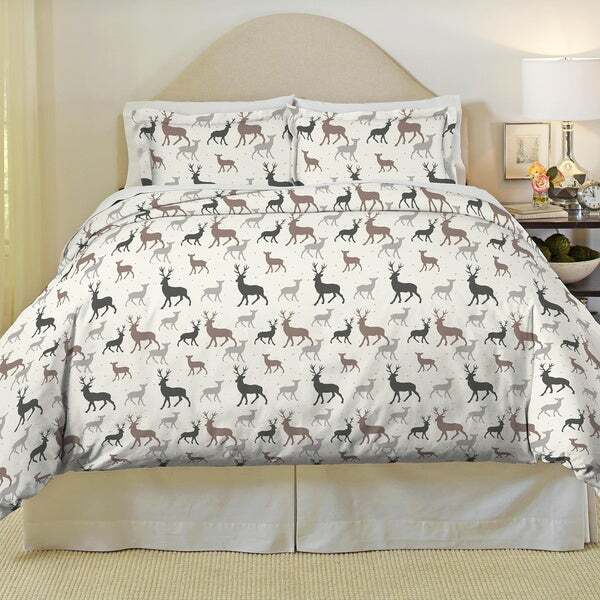 This warm and comfortable duvet set features fun woodland deer designs on a white background. Crafted of 100 percent cotton, this flannel set is conveniently machine washable. Elegant silhouettes of woodland deer pattern this lodge-inspired duvet set. Made of 170 GSM heavy weight flannel, this set will keep you warm all winter long. Made of 100 percent cotton, oversized for comfort and machine washable for easy care. Soft, cozy and warm. Colors were as expected. I would buy again! This heavy weight cotton flannel duvet cover and pillow case set looks even better in person and feels amazing. My son loves that it is heavy weight and it keeps him very warm. This duvet set is by far the best purchase I have ever made. My husband even loves it and that is saying a lot. I would love to get another one in a different pattern. It keeps me at just the right temp. Not too hot or cold! Absolutely adorable - soft high quality flannel sheets . Really happy with these sheets and I was able to purchase them for a very good price ! I bought them for a vacation log cabin and think they are going to last a very long time . Hope that they remain soft and love the style and colors . I was concerned that a "full/queen" would be small for my queen down comforter. It isn't. It's also heavy flannel so it feels very durable. And i love the new look in my bedroom. Very pleased. Smaller than the blanket I bought at the same time. Does not fit well. The bottons cannot seal the blanket in well. Also the twin size is actually a 2-piece set. Great material, soft, larger than a typical queen duvet, just like the picture. Highly recommend! Very warm comforter. Large King, lots of room for my insert. I ordered this for my son and he absolutely loves it! It is Exactly how the picture looked! It is very soft and definitely keeps you warm at night! Great quality. Love it... ordered a queen size for my rental property and liked it so much also ordered a twin for another property. very nice set looks beautiful. Great quality flannel… Super thick and warm! "What exactly are the colors? The darker color, is that dark grey, blue? Thanks in advance!" My husband is a hunter. Thought this wood look great in our cabin. Think my husband will like the deer. Also because it is Heavy Weight Cotton Flannel. The price is great too!